Come the end of 2016, unless people's memories can't stretch back that far, we fully expect to find 3 Ravens' Double IPA appearing on many a Best of list. 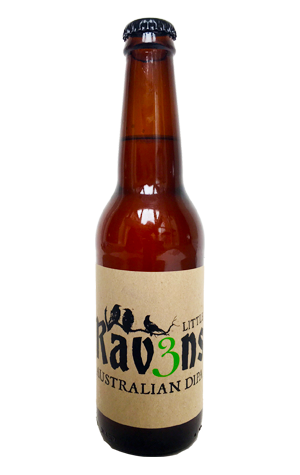 Their stab at the sort of high ABV, highly hopped beer so beloved of Americans was one that impressed wherever it landed – here's what we had to say about it – so for their latest Little Raven small batch release they're looking to repeat the trick, albeit with a twist. This time around, the US hops have been replaced entirely with local varieties, from old school Pride of Ringwood for bittering to a combination of Galaxy, Ella and as-yet-unnamed experimental variety known only as HP-035, the last of which was added in large amount (5kg) and flower form in the brewery's impromptu hopback. It's a little lower in booze than its American counterpart and higher in bitterness too. As for how it presents, again it's lean and clean with the hops offering up mandarin, apricot, grapefruit and pineapple aromas alongside the pale malt and alcohol sweetness. There's more of a spicy, earthy, prickly nature to the taste, as well as a minerally dryness. As for the aforementioned higher bitterness (85 IBU), it's a slow-burner but gets to you in the end.